Would you factor? Would you complete the square? Quadratic Formula? Are those my only options? Transitioning to more algebraic/abstract examples seems simpler when relating quadratics to numerical examples like this vine. He looks at the factors and the relationships between the terms. Students in his class are prescribed a formula, but asked to make sense of the relationships and then transition to methods with more regularity. A method often confusing to Algebra 1 students because of its abstract structure is again made simple with looping short videos. Plenty of teachers try to support their process with visualization, all that is intended here is to start with the visual reasoning and pattern making, then move to abstract. It’s not exactly completing the square. 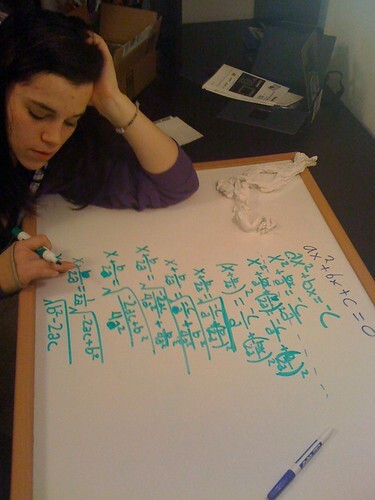 It’s not exactly factoring and using the roots. It’s the compromise between the two. But wait, the two points (x1,0) and (x2,0) that plot on the horizontal axis can be any combination that adds up to your linear coefficient “b”. 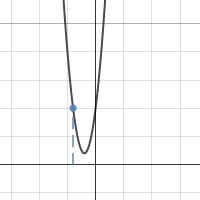 The vertical shift just needs to balance those numbers with c.
Play with the applet and notice that as long as the quadratics share the same line of symmetry, only a vertical shift is needed to overlap. This also reveals the congruence in some quadratics. Ask yourself what makes the quadratics congruent? 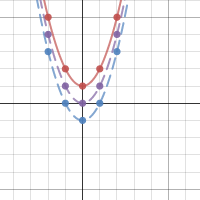 Here’s a similar interactive graph built with Desmos. What other questions might you ask?